What if someone asked you what’s the most popular platform to build websites? There is no doubt in the fact that you would be advised with WordPress. Currently being the #1 choice to create online projects of any level of difficulty, it powers more than one-third of all sites worldwide. Still, WordPress is not the one and the only solution to get your site live. There are plenty of alternatives offering usable functionality to get your own project on the web worry-free. Today, we are going to decide whether it’s Squarespace or WordPress or maybe MotoCMS the best solution to launch your site in 2018. So, why not compare Squarespace vs WordPress vs MotoCMS? In order to help you choose the most optimal option for your future site, we have broken down this post into several sections. Each of them compares the functionality of Squarespace, WordPress, and MotoCMS. Look through the explanations and pick the most optimal solution to launch your own site. First, before we proceed to the Squarespace vs WordPress vs MotoCMS comparison, let’s find out what each of these web solutions entitles. MotoCMS is a simple and feature-rich WYSIWYG website builder. It comes loaded with a handful of premium tools. Usable features allow even non-techies to create versatile web pages hassle-free. In order to work with the builder, you do not need to have any special coding skills. MotoCMS allows you to bring changes to your site in the real time. You simply drag and drop multiple design elements, edit texts, add/remove items in the visual mode. With the help of MotoCMS, people can launch their personal or business projects while simply completing three easy steps. In order to build a site code-free, you can choose a ready-made design in the collection of 2,500+ themes for all purposes imaginable. Next, modify the content in the drag-and-drop interface. When you finish the theme customization, launch your site to the web. With MotoCMS, you can create fast-loading and responsive sites that are integrated with the popular social media solutions, SEO-friendly, and can handle eCommerce functionality perfectly well. Squarespace is one of the most popular do-it-yourself website builders. With its help, you can create visually stunning web pages that are optimized to scale up and down to all screen sizes automatically. The software features the highly intuitive interface. It can be handled without any special programming skills. Thanks to the regular system updates, the software is enhanced with new features and integrations every once in a while. Squarespace will be the perfect solution for everyone looking for a platform to bring their personal projects or small businesses online. It features the dynamic style editor. This provides you with a handful of powerful customization possibilities. Similar to MotoCMS, there is a possibility to choose from a wide range of pre-designed templates. These can make the process of the site creation much quicker and easier. One of the best things about the software is the ability to navigate your site while you preview it. Squarespace provides you with a range of page elements that you can choose from. These include staple elements for text, images, buttons, charts, galleries, etc. WordPress is the leading content management system in the world, which allows you to build sites of any level of difficulty. WordPress is proud to have one of the largest communities of web designers and developers on the web. pick a ready-made WordPress theme (or build a site from scratch), and you are ready to go. Most beginner-level users are not familiar with the code-related things. When an expert webmaster is provided with the opportunity to create a site code-free, he doesn’t miss a chance to save time and effort on the site creation. Whether you are a beginner or a pro, you want to use a platform that will help you build sites easily. Let’s see how MotoCMS vs Squarespace vs WordPress stack up in this category. WordPress is an easy-to-handle content management system. It provides you with lots of choices that will appeal to both beginners and experts. With its help, you can launch a blog, a personal site, online portfolio, business or a large corporate project, etc. When enhanced with the WooCommerce plugin, you can also use the platform to sell products and services to your clients. Although it’s easy to work with WordPress, the CMS still requires the understanding of its terminology and basic concepts. For example, there is a difference between posts and pages, themes and plugins, categories and tags, etc. In order to manage these concepts properly, you should be ready for the slight learning curve. Using WordPress for a blog is rather easy. 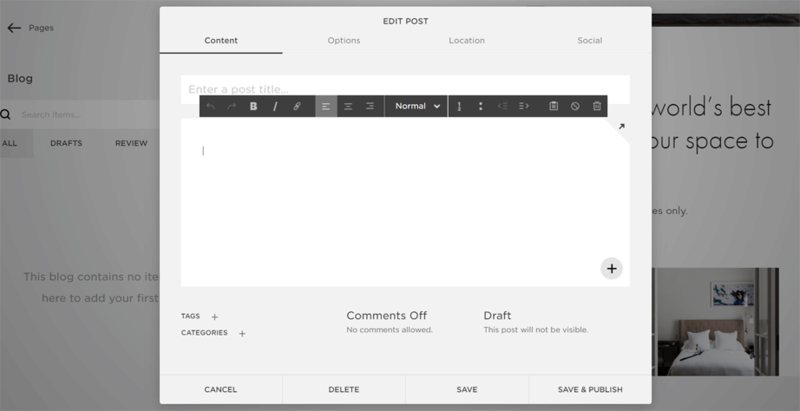 The default post editor is intuitive to handle. It contains both visual and text modes. A series of the interactive functionality is included to upload posts and pages with images, videos, links, galleries, etc. As seen in the screenshot, the admin panel can be enhanced with extra features, plugins, and modules. These which will let you boost the performance of your site to the great degree. Unlike WordPress, Squarespace has fewer choices to create the content. However, the number of features that the admin panel provides is enough for the beginners who have never launched their site before. Compared to WordPress, Squarespace makes it easier to add images, videos, and other pieces of content to posts and pages. All pieces of data are tweaked by means of the drag-and-drop editor. So, you may feel free to create pages intuitively. Posts, pages, widgets, navigation patterns, and other elements of your site are ready to be managed intuitively, in the visual mode. As soon as you sign up for free, you will be provided with a choice of themes that can become the foundation of your future web project. Similar to Squarespace, you can access MotoCMS website builder as soon as you select a ready-made theme. MotoCMS themes are premium web solutions. Still, there are 14-day free trial versions available. This allows you to see how the chosen web product works and feels from the inside before you make the final buying solution. MotoCMS works similar to the majority of website builders in the market. As soon as you upload the chosen CMS template to the server, you can start bringing changes to the ready-made layouts. All changes are applied in the visual mode. The drag-and-drop page builder lets you change the location of different elements on the page, write texts, upload visual content, manage site navigation, and run a whole lot of other tasks code-free. The rich selection of extensions is the real power of WordPress. You can upload your site with any free or premium plugin, module or widget that you want. Building a site with a WordPress theme, you will access the functionality that’s available in the ready-made design. Premium WordPress themes have a number of benefits over freebies. Choosing a paid web solution, you will work with the premium and custom features. You can also upload the drag-and-drop functionality or WordPress Live Customizer. You can optimize pages and posts of your WordPress blog/website with the help of SEO plugins. The respective functionality will be added right to the admin pane of your site. This frees you from the need to hire SEO specialists and keep a close eye on the promotion of your web resource. The features set is the area where Squarespace lags behind its competitors. In addition to the limited set of templates, Squarespace provides a limited choice of features that are integrated into the builder. There are still a few options that you will be able to use during site development. Squarespace lets you optimize posts and pages of your site for the higher ranking in search engines. Site titles, headings, images, tags, categories, and other elements of your site can be optimized for the higher ranking and better visibility in the search engines. 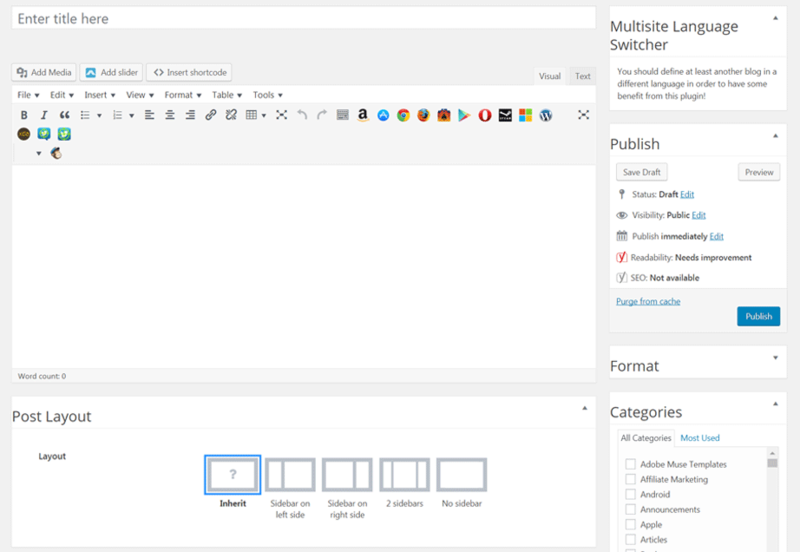 Every MotoCMS template contains a collection of widgets, which are intended to be applied to the niche-specific web projects. These include media, forms, menu, maps, Mailchimp, forms, and other widgets that can be enabled or disabled anytime. The drag-and-drop builder features every piece of functionality that you will need to build a secure and reliable site. There is an option to integrate your site with Google Analytics and Google Webmaster Tools. This lets you keep a close eye on the performance stats of your site. In terms of SEO optimization of your site, MotoCMS allows you to add SEO tags to all pages of your site. You can optimize images with “alt” texts, hide pages from indexation, use 301 redirects, etc. WordPress is ready to be integrated with a number of payment methods. Thanks to the wide choice of plugins, the CMS supports PayPal, Google Checkout, Payoneer, and even Bitcoin. WordPress can be enhanced with WooCommerce and Ecwid eCommerce plugins. With their help, you can turn your site into the fully fledged web store. There are a number of additional eCommerce plugins, which are ready to be added to your web resource in minutes. There are also tools to track affiliate links and affiliate sales. Squarespace provides limited eCommerce options. The software supports only Stripe payment processing method, which is accessible in the limited number of counties only. Other payment methods are not supported. Such limitations may have the bad effect on the growing businesses. Squarespace sets limitations on the number of products that you can sell on Personal and Professional plans. In order to sell 22 products on your site, you will need to opt for a Business plan, which is more costly than the Personal solution. There is a limited support of the third-party extensions either. MotoCMS now features the fully fledged eCommerce plugin. There are also ready-made MotoCMS eCommerce themes available. 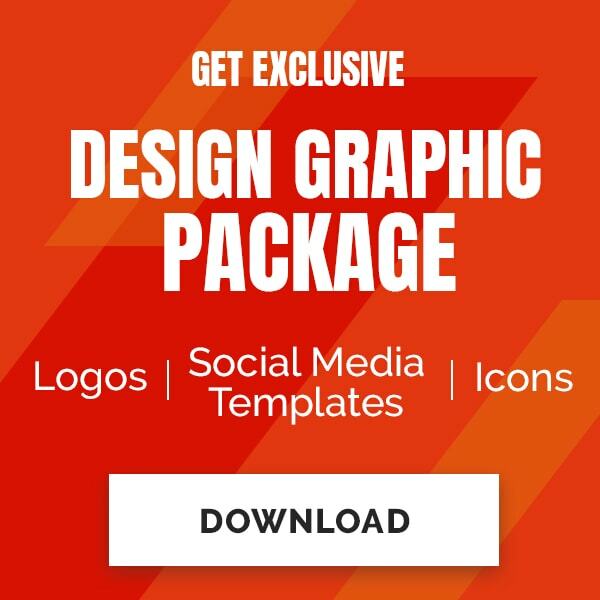 This gives you the freedom to pick a pre-designed template that will match your brand, customize it a little bit, upload your products, and bring it to the web. The eCommerce functionality provides you with the access to stats, orders and products sections, catalog, discounts, payment, customers, and other sections. WordPress is available for free download. You may feel free to use, change, edit, and build sites on its basis. In order to launch a website, you will need to select a web hosting provider, buy a domain name, and choose a pre-designed theme (optional). WordPress community sells both free and premium themes. Different providers set different costs for their digital products. You can choose the most optimal solutions based on your own budget and needs. Squarespace pricing plans depend on the type of a website that you want to create. A personal site will cost you $12/mo (billed annually or $16 month to month). To build a business site, you will need to pay $18/mo (billed annually or $26 month to month). Online stores cost more. The basic store will cost you $26/mo, whereas the advanced site will cost $40/mo. Whatever plan you choose, you will be provided with 24/7 premium support, SSL Security, Free Custom Domain name, and a number of extra features. Therefore, in the Squarespace vs WordPress fight, this one would probably lose. MotoCMS is not free. Buying a MotoCMS template, you will be charged only once. All further updates and customer support services are provided for free. You can take the chosen theme to any hosting provider. The web hosting expenses will depend on your choice solely. MotoCMS themes cost $139 and higher. There are both blogging, business and eCommerce solutions available in the collection of MotoCMS templates. We hope you like the Squarespace vs WordPress vs MotoCMS comparison. Make the choice of the best platform to launch your site based on the purposes that you pursue and the final results that you’d like to achieve. Squarespace will work well to create personal sites and small business projects. It will hardly manage to hardly manage to launch a feature-rich web store. On the other hand, Squarespace is best suited for writing posts. WordPress can handle blogs, business, and eCommerce projects perfectly well. The availability of extensions and themes allows you to boost the performance of your site with any piece of functionality that you need. Free and premium WordPress-based products let you launch online projects of any level of difficulty. As per MotoCMS, it will handle personal sites, blogs, portfolios, corporate and eCommerce sites perfectly well. The intuitive drag-and-drop interface allows you to launch any web project of yours code-free. The wide choice of ready-made themes enhanced with the niche-specific functionality allows you to launch your web resource in the shortest period of time.